These Indoor/Outdoor speakers feature the same tweeters and woofers as our "Top-Rated" DV52si bookshelf speakers. Their 5 1/4" woofers deliver full-range output to below the built-in subwoofer crossover point for Dolby Digital receivers. They include both cloth indoor and anodized screen outdoor grilles. The keyholes on the back of AdattoV52si cabinets enable easy wall or corner mounting without having to purchase extra mounting brackets. They are ideal for home theatre use, and all music formats. BIC models that match well with the AdattoV52si are the DV52si (Bookshelf Speakers), DV52CLR-B (Center speaker), DV53CLR (Center Speaker), M-SR5 (Ceiling Speakers), and M-50 (In-wall speakers). 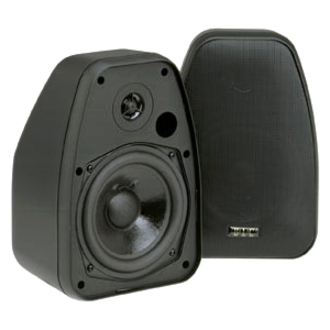 The AdattoV52si speakers are available in Black, Silver, and White.